"The central conflict of 'Star Wars' looks considerably different -- and much, much funnier -- through Brown's eyes. "- Comic Book Resources "When the first Star Wars film conquered the world in 1977, no one could have possibly foreseen it going on to become such an ubiquitous part of our cultural heritage. Now even parenthood can be viewed through the filter of the Sith lord Darth Vader. Jeffrey Brown (Incredible Change-Bots) crashes headlong into George Lucas's galaxy far, far away with endearing, funny-and fully licensed-results. A series of full-page gag cartoons focusing on the 'what if?' of Darth Vader raising a four-year-old Luke Skywalker, the book twists father/son moments into scenarios within the Star Wars playground. For instance, the addition of a wailing little Luke turns the Bounty Hunter scene into, as one bounty hunter's thought balloon puts it, Awkward! Trick-or-treating, toy shopping, a day at the zoo, and more are rejiggered with a lighthearted, charming tone. However, the book also provides ample proof that adding a babysitting Darth Vader to any Star Wars situation makes it gently humorous. Brown's signature scratchy style is embellished with full color and stripped-down likenesses. "- Publisher's Weekly "It's fun to see Darth Vader as sort of a sensitive guy." -Los Angeles Times' Hero Complex "Just let me just be the first to tell you that, if you play your cards right and get him a copy, Darth Vader And Son is gonna have Dad laughing coffee through his nose this year at brunch." -Babble.com "From potty training to lightsaber batting practice to ice cream runs, the endearing absurdity of the duo's dynamic makes for a remix treat of the most entertaining variety. "- Brain Pickings "The book imagines a universe where Darth Vader actually gets to raise his son Luke and it is so disarmingly charming that you really stop caring that this is an evil Sith lord. Oh, Obi-Wan, why did you spirit those children away?" -TOR.com "As a Star Wars generation kid-disclaimer: the original Star Wars movies, not the prequels-this little book was pure joy. I now read it with my five-year-old daughter, who cracks up at little Luke and a much kinder, gentler Darth Vader. "- Chicago Magazine "Darth Vader and Son is cute, and perfect for the little Star Wars fan in your life. It playfully posits the question "What if Darth Vader had actually raised Luke?" 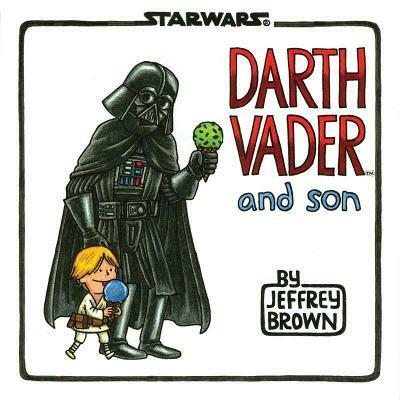 Author and illustrator Jeffrey Brown turns run-of-the-mill parenting activities into fun moments full of Star Wars references...Overall, Darth Vader and Son is a fun read for adult Star Wars fans who like a good laugh, as well as for children just learning to love these characters." Wink Books and BoingBoing "Do you and your Dad have a Star Wars bond? Then you're definitely going to want to nab this sweet and funny comic about Anakin & Luke Skywalker." -E! Online "Hilarious...it's a great book to read to your kids, but it's also a great book for adults. I find myself smiling as I turn each page." --Forcecast.net "It is funny and sweet and the perfect stocking stuffer for Star Wars-loving dads." --Victoria Times Colonist "This is a good one for a young geek or their proud papa. " -Ain't It Cool News "You won't find a more adorable Star Wars book this year than Darth Vader and Son. Seriously. It's a must-have for Star Wars fans of all ages, as it's not only insanely cute, it's quite humorous,"
--Geeks of Doom "But if you're one of those sad, empty few who haven't picked up Vader and Son, for yourself, a child, a Star Wars fan, a carbon-based lifeform, or anyone who likes things that are Good - do yourself a favor and pick it up, because not only it is adorable and funny, but it's also one of the best Star Wars books ever. In fact, buy two, because you're going to want to give a copy to somebody over the holidays, no question. " -io9.com "Darth Vader and Son is Brown at the top of his artistic game with beautiful full-color pages, many of which seem imbued with a sincerity that I would expect to find in his next autobiographical work, A Matter of Life. Darth Vader and Son is a book for fathers and sons and Star Wars fans and, well, pretty much anyone who enjoys happiness and smiles. " -Comics Bulletin "Devoted Star Wars fans will love that Brown has taken Darth Vader's lines from the movies-'I am altering the deal. Pray I don't alter it any further'---and cleverly turned them on their heads, finding the humor in both parenting and movie fandom, especially when he pokes gentle fun at the newer movies." - ICv2.com "Fans of Star Wars will be entertained by this heartwarming and comical twist on the epic classic. Through vivid illustrations, author Jeffrey Brown shares the tale of Darth Vader, the hands-on, over-protective dad, who's involved in Luke's everyday activities"
--Real Simple "Mix "Star Wars" with cuteoverload.com, and you get Jeffrey Brown's adorable "Darth Vader and Son" from Chronicle Books..[it] just had me melting, "awww"-ing and/or giggling over almost every page. And I'm not even a dad.. geek dads, especially those with little kids, would totally appreciate"
-Geek Watch, DetroitNews.com "This book is hilarious, short, and sweet. I'm sure it will have a real wide range of appeal that will include both young and die-hard Star Wars ones. There's probably not wrong reason to gift this, but it would definitely make for a good Father's Day present if you really need an excuse to buy Darth Vader and Son." --CSI: Librarian "You don't have to be a Star Wars fan to appreciate this tender little book." -The Guardian (UK) "Darth Vader and Son [is] a sweet mashup of Star Wars and father and son bonding"